To commemorate President’s Day, City Hall hosted a Naturalization Ceremony where 25 people, from 15 countries took the Oath of Allegiance to officially become United States citizens. 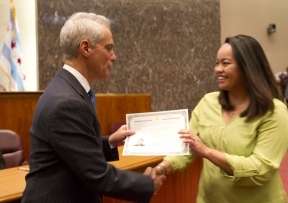 Monday marked the ninth Naturalization Ceremony hosted by Chicago as part of the City’s New Americans Initiative. “Today you are citizens in a country that is more than just a place on a map, but a set of ideals,” said Mayor Emanuel. “The immigrant story is the American story. It is our nation’s heritage and our greatest source of vitality and prosperity. 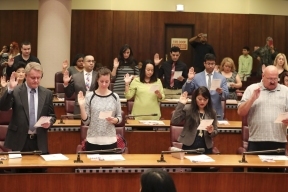 And here is this city, in this country, we will always ensure that that principle will be honored and protected.” For more information on the services available to Chicago’s immigrant and refugees communities, visit the Office of New American website at www.cityofchicago.org/newamericans.